In July, 2017, the Young Innovators to Watch scholarship was hosted for the third year by CE Week New York. Miguel Gamiño, CTO of New York City, spoke to the winners and the crowd about the importance of empowering youth through tech education, as well as the critical importance of net neutrality to ensure they have the resources they need. We welcomed back some of our most passionate and insightful judges, including Diane Levitt of Cornell Tech, Brian Cohen of New York Angels, Warren Buckleitner of Children’s Technology Review, and Robin Raskin, Tonda Bunge Sellers, and Kerry Goldstein, all of Living in Digital Times. We also added some exciting new minds in Tom O’Connell of Code/Interactive, Vince Ponzo of Columbia Business School, and Emily Post, a former Young Innovators winner. Our sponsors WowWee, Monster, and B&H Photo generously rewarded another fantastic group of young inventors and thinkers. 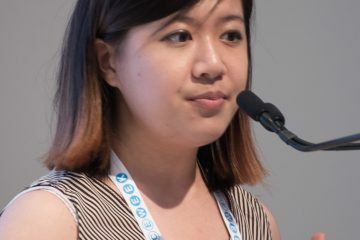 Sharon Lin (18), of Stuyvesant High School created White Water, an app for underdeveloped communities that identifies bacteria and abiotic particles in water based on a photo sample, making it easier for underdeveloped communities to take preventative measures to avoid exposure to water-borne illnesses like malaria. 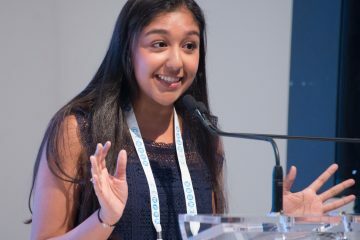 Priya Mittal (17), from The Dalton School, created GroGreen, an app that allows restaurants and juice bars to purchase imperfect produce directly from farms at a 20% mark down to reduce food waste. Farmers can still sell produce that they would normally throw away and increase profit margins. Deeya Patel (14), Divek Patel (12), Nitin Seshadri (13), Karan Keerthy (11), Sriram Pankanti (11), Srinath Duri (10), a team made up of students from St. Augustine School, Somers Middle School, Briarcliff Middle School, crafted ADVISE—Assistance for Dog & Visually Impaired Subjects, a wearable device that uses a Kinect sensor to alert the visually impaired to obstacles. It identifies the size, location and number of obstacles and provides an audible or haptic feedback to the person. Abigail Brown (18), Yousef Alsayid (17), Curtis Mason (17), and Mark Ayad (16), all from Staten Island, make up MACAY Labs. Together they built HiFi Mod, A high-fidelity speaker designed to attach to a smart phone, allowing users to customize their audio experience with studio-quality sound. Audiophiles and musicians can record with compatible equipment and share their sound on the go. Michael Klamkin (16) from Staten Island Technical High School used Dual Extended Kalman Filtering to create a new approach to monitoring the state of charge of lithium-ion polymer batteries. Using an algorithm that combines an electrical circuit model, MATLAB and Dual Extended Kalman Filtering measures phone battery life more efficiently than the battery life monitor built into a phone.